Manufacturing is making daily progress aiming a better life. Hirata’s mission is to support manufacturing in various industrial fields. Hirata manufactures customised company solutions every day. We market production system for various industrial fields, such as the automobile, semiconductor and home electronics industries. Ever since our establishment, we have manufactured a variety of production equipment in a wide range of industrial fields. With this past performance and experience. Hirata ‘s unique know-how and technologies in manufacturing for various fields provide manufacturers, which are our customers, with a high level of advice to meet their challenges. For years to come, we will keep trying to create new value with our original ideas. 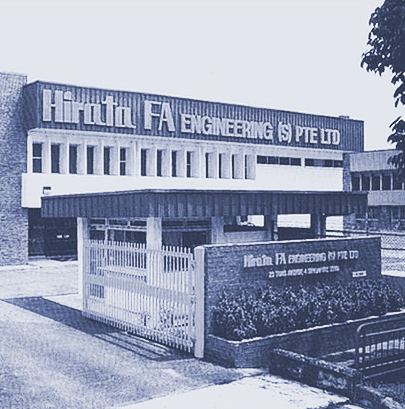 Established since 1991, Hirata FA Engineering (S) Pte Ltd is one of the world’s leading engineering companies in the design and manufacturing of factory automation such as Robotics System, Auto Packaging Systems, Automated Assembly Line and Automated Storage System. We understand that each and every customer has his specific requirements. We connect with our customers by putting ourselves in their shoes and seek to understand each individual’s request through his perspective. We put in great amount of time and effort to know their specific requirements and provide customised solutions to fulfill that. We are determined to be more than just a system solution provider. We endeavor to be a business advisor to each of our customers. We can make a difference through our innovative approach and unique perspectives. With over 24 years of experience, a valuable partner to our customers, and we believe in cultivating long term business relationships. Our customers’ success are representatives of our success. Hirata FA Engineering (S) Pte. Ltd. founded in Singapore as a subsidiary. Hirata Engineering (Thailand) Co., Ltd. founded in Thailand as a affiliated company of HSL. Hirata FA Engineering (M) Sdn. Bhd. established in Malaysia.